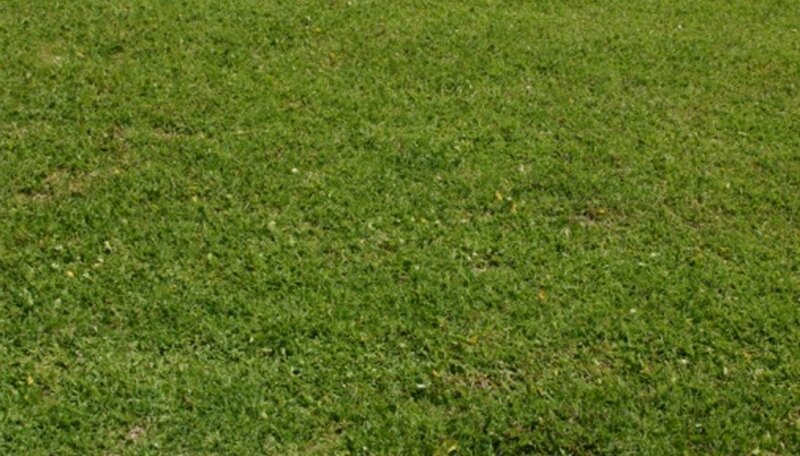 Zoysia, a warm-season grass, thrives in full sun or partial shade. This slow-growing grass species requires less frequent mowing, but must be watered regularly. Many different types of zoysia exist, each with their own advantages and disadvantages. Solve or avoid some of the more common problems of Empire zoysia by giving the grass suitable growing conditions and regular maintenance. Emerald zoysia offers fine-textured, densely growing leaves, better cold-hardiness and more shade tolerance than other zoysia cultivars. Developed in Georgia in the 1950s, it is a hybrid of Zoysia japonica and Zoysia tenuifolia. In contrast to its many benefits, Emerald zoysia quickly develops a layer of thatch and often succumbs to dollar spot, brown patch and leaf spot. Apply fertilizer on a bi-monthly basis throughout the growing season. Thatch is a layer of dead grass and other organic matter between the soil and green areas of the grass blades. Thatch keeps water and fertilizers from reaching the roots while providing a home for insect pests and encouraging disease. Emerald zoysia builds up thatch very quickly compared to other zoysia cultivars. Annual dethatching with a vertical mower keeps thatch under control in the Emerald zoysia lawn. Aerating also keeps thatch from developing too quickly. Emerald zoysia grows best when mowed to a height of 1/2 to 1 inch approximately once every two weeks throughout the summer months. A sharp reel mower works best, according to University of Florida Extension. Supplying 3/4 inch of water when grass starts to wilt provides adequate hydration without adding excessive moisture to the lawn. Fertilizing and watering Emerald zoysia properly often keeps diseases at bay, according to University of Florida Extension. Applying fungicides annually in the fall offers additional protection against these diseases as well. When they do occur, they often correct themselves when growing conditions become more favorable. Can You Overseed During Winter?